Right as the July heat began to simmer the sickly humid air and warp the atmosphere into a sweaty stew, the latest collection of madness released from this Nashville duo became an unexpected soundtrack to summer, permeating the psyche with tales of madness and absurdity told through the most weirdly seductive freak bungle. 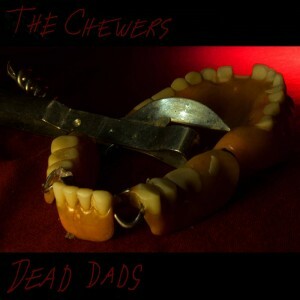 Plodding, lopsided, and spacious, The Chewers have honed their oddly odd sonic stew on Dead Dads, their third album, with disciplined songwriting that forces every pit and peak of their idiosyncratic music and madcap storytelling to shimmer in the haze. While they’re completely in a league of their own, those who are susceptible to the spaces between Tom Waits and King Missile, or in league with indie oddities like The Guinea Worms or The Country Teasers, may also be attracted to this lumbering freak feast. This entry was posted on Monday, September 14th, 2015 at 12:56 am	and is filed under 2010s. You can follow any responses to this entry through the RSS 2.0 feed. You can leave a response, or trackback from your own site.